CAMBRIDGE, England - British scientist Stephen Hawking has decoded some of the most puzzling mysteries of the universe but he has left one mystery for the rest of the world to solve: How he has managed to survive so long with such a crippling disease. As for Hawking himself, he says there is only one enduring mystery of the universe he has found impossible to crack: Women. At least, that is what he told New Scientist magazine in an interview for his upcoming 70th birthday celebration when they asked what he thinks about the most during the day. "They are a complete mystery to me," Hawking said. The physicist and cosmologist was diagnosed with Lou Gehrig's disease when he was a 21-year-old student at Cambridge University. Most people die within a few years of the diagnosis, called motor neurone disease in the U.K. On Sunday, Hawking will turn 70. "I don't know of anyone who's survived this long," said Ammar Al-Chalabi, director of the Motor Neurone Disease Care and Research Centre at King's College London. He does not treat Hawking and described his longevity as "extraordinary." "It is unusual for (motor neurone disease) patients to survive for decades, but not unheard of," said Dr. Rup Tandan, a neurology professor at the University of Vermont College of Medicine. Still, Tandan said many longtime survivors had ventilators to breathe for them  which Hawking does not. Hawking first gained attention with his 1988 book "A Brief History of Time," a simplified overview of the universe. It sold more than 10 million copies worldwide. His subsequent theories have revolutionized modern understanding of concepts like black holes and the Big Bang theory of how the universe began. To mark his birthday Sunday, Cambridge University is holding a public symposium on "The State of the Universe," featuring talks from 27 leading scientists, including Hawking himself. For 30 years, he held a mathematics post at the university previously held by Sir Isaac Newton. Hawking retired from that position in 2009 and is now director of research at the university's Centre for Theoretical Cosmology. Hawking achieved all that despite being nearly entirely paralyzed and in a wheelchair since 1970. He now communicates only by twitching his right cheek. 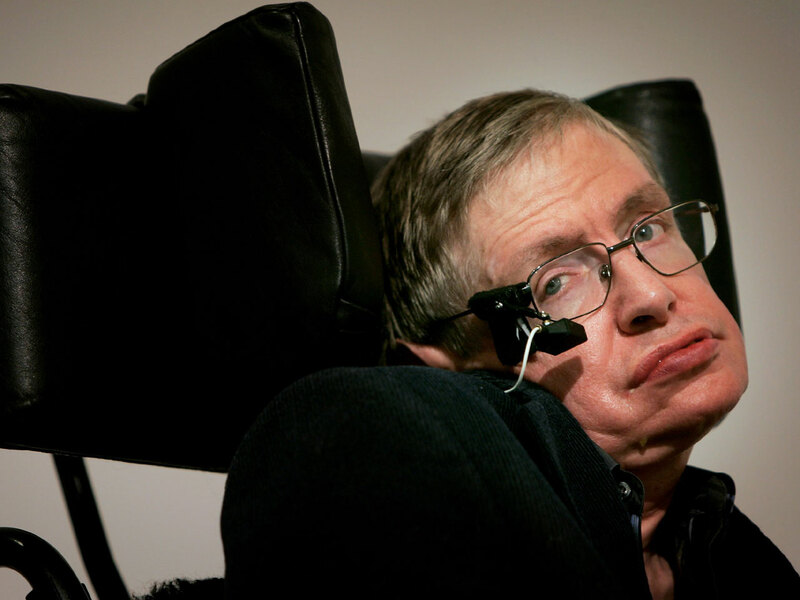 Since catching pneumonia in 1985, Hawking has needed around-the-clock care and relies on a computer and voice synthesizer to speak. A tiny infrared sensor sits on his glasses, hooked up to a computer. The sensor detects Hawking's cheek pulses, which select words displayed on a computer screen. The chosen words are then spoken by the voice synthesizer. It can take up to 10 minutes for Hawking to formulate a single sentence. "The only trouble is (the voice synthesizer) gives me an American accent," the Briton wrote on his website. It took Hawking four years to write his last book, "The Grand Design," missing his publisher's original deadline. Hawking declined requests from The Associated Press for an interview, but his personal assistant, Judith Croasdell, spoke to the AP. She described her boss as remarkably patient. "The way he communicates can seem frustratingly slow to most people but he doesn't let that impede his thinking," she said. After a brief hospital stay, Hawking told her that he spent the time thinking about black holes. Hawking typically comes into the office after a big breakfast and reading the news, Croasdell said. "He's not an early morning person, but he does stay quite late," until about 7 or 8 in the evening, she said. Hawking's rooftop university office is crammed full of memorabilia: family photos, a miniature NASA shuttle, and a signed picture of himself with President Barack Obama and his wife, Michelle. On top of physics books sits a disability access guide for the university. Hawking's fame has led to guest appearances on some of his favorite television shows including "The Simpsons" and "Star Trek." His animated likeness from "The Simpsons" has even been turned into an action figure  one of which sits proudly on his office desk. There's also a Homer Simpson clock that Hawking is known to glare at when visitors are late for an appointment. "He's a big ham, he loves the spotlight," said Kitty Ferguson, who's written two biographies of the physicist. She said he has a wry sense of humor and has programmed his computer to respond to random encounters with people who ask if he's Stephen Hawking. "No, but I'm often mistaken for that man," his voice synthesizer deadpans. Lou Gehrig's disease, also called amyotrophic lateral sclerosis, or ALS, attacks motor neurons, cells that control the muscles. Patients typically suffer muscle weakness and wasting, become paralyzed and have problems talking, swallowing and breathing. Only about 10 percent of patients live longer than a decade. People who are stricken at a young age, as Hawking was, generally have a better chance of surviving longer. Most people are diagnosed between 50 and 70. Life expectancy generally ranges from two to five years after symptoms like slurred speech, difficulty swallowing and muscle weakness set in. Hawking's personal physicians don't discuss his condition with the press, Croasdell said. For some reason, the disease has progressed more slowly in Hawking than in most. Al-Chalabi and colleagues are analyzing a DNA sample from Hawking, along with those of other patients, to see if there is something rare about his disease or any genetic mutations that could explain his long survival and if that information could be used to help others. Some experts said the type of care Hawking has, including about a dozen health workers 24 hours a day, may have extended his life expectancy. "The disease can sometimes stabilize and then the kind of care delivered may be a factor in survival," said Virginia Lee, a brain disease expert at the University of Pennsylvania School of Medicine. "Remaining mentally alert is also extremely important and he has clearly done that." Hawking says he tries not to think about his limitations. "I have had (Lou Gehrig's disease) for practically all my adult life," he says on his website. "Yet it has not prevented me from having a very attractive family and being successful in my work," he writes. "I try to lead as normal a life as possible and not think about my condition or regret the things it prevents me from doing, which are not that many." From the office pictures documenting his achievements, that certainly seems to be the case. Framed photos show the physicist with several popes and on memorable trips to China and Easter Island. He has even flown in a space simulator. In 2007, Hawking took a zero-gravity flight in Florida, the first time in 40 years he abandoned his wheelchair. "That was the happiest I've ever seen Stephen," said Sam Blackburn, Hawking's graduate assistant, who accompanied him on the ride along with about a half-dozen others, including two doctors. "He just had the biggest grin on his face." Hawking has also been married twice and has three children and three grandchildren. With his daughter Lucy, he has written several children's books on physics. Al-Chalabi said most patients with Lou Gehrig's disease succumb after their breathing muscles stop working. He had no predictions for what the biggest health risks to Hawking's future might be. "He is truly remarkable," Al-Chalabi said. "This is someone who's managed to find ways around every single problem the disease has thrown at him."